Looking for a new suit to crush your laps with? Here’s your guide to the best men’s training and lap swimming suits. Although its primary function is simple (cover up your you-know-what’s), the type of swimsuit you end up choosing depends on a variety of things. 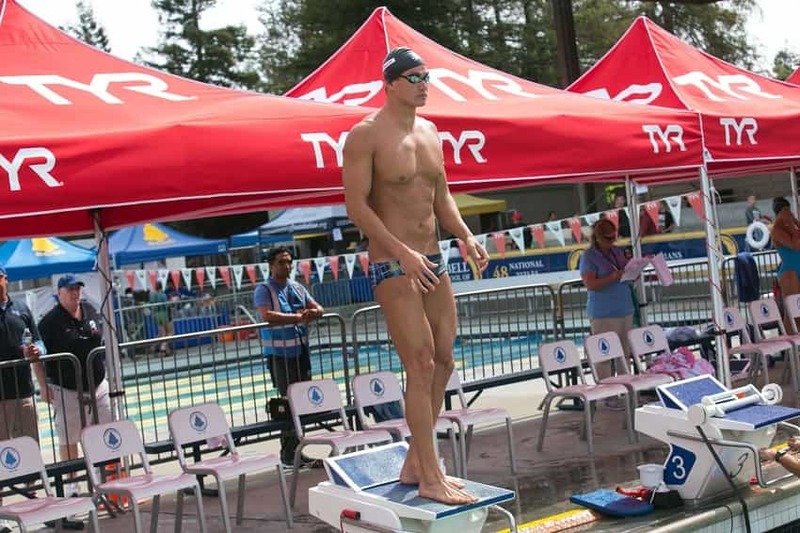 In this complete guide to training suits for swimming we are going to look at the four types of training suits, including briefs (“Speedos”), square-leg training suits, jammers, and drag suits. We will take a look at fabric composition, cut, level of resistance, style options, as well as list our top picks for each kind of training and lap swimming suit. When non-swimmers think of the suits we wear, this is what they have in mind. The swim brief—more commonly known as the “Speedo”—is the most common suit swimmers wear in practice and during lap swimming. They provide a high range of freedom, are cheap, and because they are almost always made of polyester, last a long time. Of course we would have to lead off the list of best swim briefs with Speedo’s offering. Their most popular training brief, PowerFLEX is made of recycled nylon and 22% XTRA LIFE lycra. The result is a suit that is resilient to the harsh chemicals in the pool while also providing a comfortable fit. Available in sizes 30-40, the PowerFLEX brief comes in about half a dozen different colors. FINIS is one of my fav swim gear companies. Their brief is simple (what’s there to complicate? ), form-fitting, and holds up well against long bouts of training in chlorinated water. 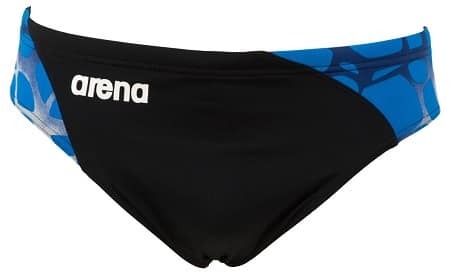 Mostly polyester, and build with their MaxLife fabric, Arena’s Carbonite briefs are resistant to chlorine and sunlight. They are available with a range of different colored patterns on the hips. Spicing things up when it comes to patterns and colors is Nike’s brief offering. 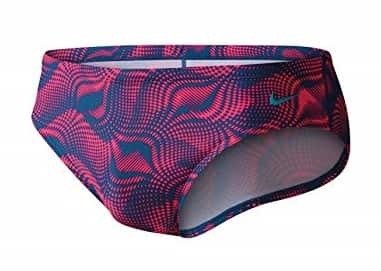 While Nike isn’t traditionally known as a powerhouse when it comes to producing high-end swim gear, the few things they do manufacture stand out. 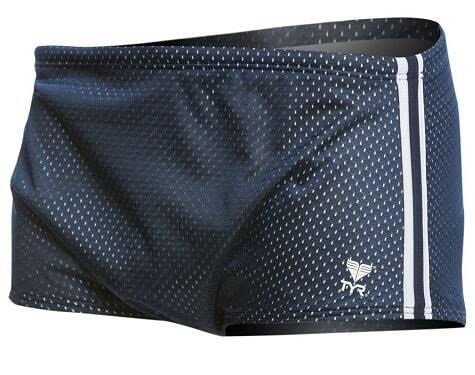 The Far Out poly brief is made of 92% polyester and 8% Spandex. The square-leg cut gives slightly more coverage than the briefs, but still provides a good degree of mobility. While they provide the same coverage as some of the drag suits that we will cover later, they are “faster” in the water because of their snug fit. Made of long-lasting polyester, Speedo’s square-leg cut training suit also features 50+ UV protection, a drawstring on the inside of the suit, dries quickly and has a comfortable, body-hugging cut. The TYR Sport square leg training suit is one of the most popular at my local pools. I have gone through a few of these suits myself, and generally like them for their comfort and durability. The suits are made of 80% polyester, 20% spandex. While not as resilient as some of the other suits (mine began to fade badly after around three months of daily use), these suits fit well. Another offering from Nike, this one a two-toned square-leg cut that is clean, comfortable and good to go for some epic training. I love the clean lines on this suit, the slightly thicker waist band (the material that holds the drawstring is often the first to go when it comes to degradation), and the suit is made of 100% polyester, giving the suit maximum life in those chlorine-infested waters. Jammers are a relatively new addition to the line-up of training suits for the dudes. For the first decades of the sport it was all about the brief and the square-leg cut. Jammers are great for a variety of reasons, not the least of which it will get you used to training with this type of suit (racing suits are almost all exclusively jammers), they are a little more modest, and can be an easy intro suit for people new to the sport that are uncomfortable going straight for the more revealing Speedo brief. 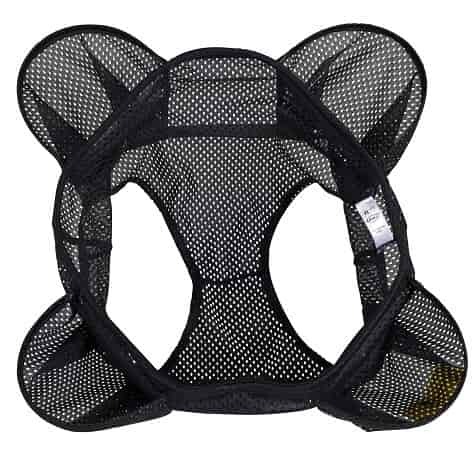 Made of polyester, this jammer is designed to be comfortable, fast-drying, and durable against both chlorine and sunlight. Due to the slight compression and tighter fit, Speedo recommends that you size up with this particular suit. This suit comes in a wide variety of sizes (Amazon carries them up to a 42” waist) and colors. The Arena Polycarbonate II jammers give you the racing suit look with a training suit. Made of two kinds of polyester, they are durable. Just how durable? According to Arena, you can expect to get about 300 uses out of a set of these bad boys. They come in six different color combos, giving you plenty of style options. 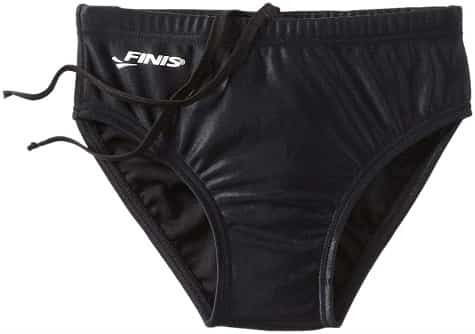 The FINIS jammer is a simple, no-frills training suit. Made of 100% polyester, this suit also includes a compression element in the upper leg area, generating a comfortable fit. These suits are designed specifically to create extra resistance in the water. They are typically made of water absorbent material that will make it a little more challenging for you to pull yourself across the water. The extra drag can be achieved with pockets (as is the case with FINIS’ drag suit), or with polyester mesh that catches water, making the suit feel heavier. This is one of the most popular drag suits around, with high level athletes like backstroke world record holder and Olympic gold medalist Ryan Murphy swearing by it in swim practice. The suit has an interior lining for support, a drawstring to help keep it snugly around your waist, and a loose fit to increase drag and resistance in the water, helping to make you a stronger swimmer in the pool. 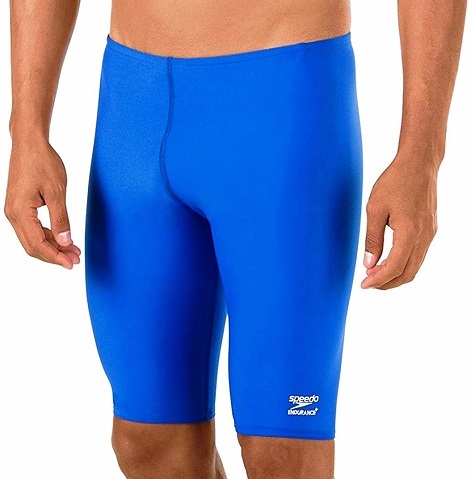 The Speedo poly mesh suit is also available in a wide variety of colors and patterns. Made in California, TYR’s mesh drag suit is made of 100% polyester and features a comfortable fit. The suit has a drawstring on the inside and an inner layer that is more form-fitting that helps keep everything where it should be. Looking to add some serious resistance to your swim training? The FINIS drag suit has got you covered, with a series of drag cups around the waist that will catch and ball up the water as you swim. Just slide it on over your regular suit (works for both men and women) and ramp up the resistance.